Many congratulations to Baildon’s Jim Wheldon, winner of the Off-Road Challenge this season after a string of consistently excellent performances including a battle to a storming category win at the Stanbury Splash. With the exception of Reena Mistry from Eccleshill the leading ten individuals were all from Baildon. 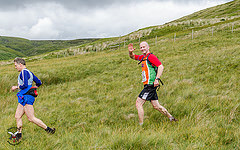 The leading runner for Queensbury in 16th place was Graham Jowett thanks to Joker points from another successful run over the long Heptonstall route. Baildon achieved another commanding win in the team competition, well ahead of second place Saltaire Striders. Queensbury just managed to stay ahead of Eccleshill for third place. The full points tables are here. Some new ones on the list at this link as well as old favourites. Let’s look forward to summer on the hills. Very good luck, and well done on all those great winter races. A great turnout of 15 runners at the Giant’s Tooth has taken Queensbury past Eccleshill into 3rd team place. Many congratulations to all who ran including Tom Collinge (2nd and just 7 seconds off the win), Andy Dovernor, Peter Hughes, Ben Clare and Mick Coe all in the top 20, and Graham Collinge, Steve Wilby, Simon Thomas and Andy Smith for fine finishes over a tough route and at the height of the festive season. Support all round the course from club members made the race a real team event, thank you everyone, and in case you have missed Matt Fielding’s video, this is the link. 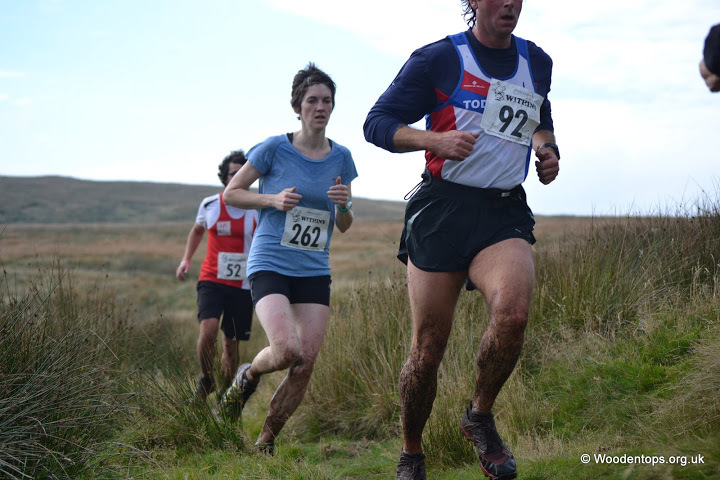 Next up in the league are the Wadsworth Trog (6 Feb, tough), Ilkely Moor Fell Race (21 Feb, technical but a manageable distance) and Midgley Moor in Calder Valley (27 Feb, great downhill finish). All the points and links to details of February and March fixtures are here. Individual and team points so far are here. The file also has links to details of forthcoming fixtures, and two great local races are heading our way. Harriers v Cyclists at Bingley (21 November) was run in thick mist last year with runners sprinting uphill away from the cyclists, who came powering back on the downward slopes. Then on New Year’s Day the Giant’s Tooth is raced round Ogden with warmth and hot drinks in the Causeway Foot afterwards. The Boxing Day Chevin Chase is full but for another festive race you can still enter online for the Jolly Holly Jog in Ripon (27 December). Good luck if you are planning to run any of these races. Scores are added automatically, so check the points file between now and March for updated individual and team tables. 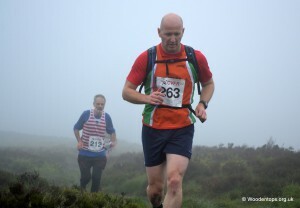 After the first race,the Withins Skyline, Queensbury are second in the team league to Baildon. The Baildon team was particularly impressive at Withins: one of their runners was so determined to finish that she completed the last half of the course with a broken leg and their large points score could not be better deserved. Nevertheless all three Queensbury competitors did well, with Alistair Gale and Lynne Robinson making impressive debuts for the club. The next races are Cop Hill (1 November) and the Wadsworth Half Trog, an opportunity for Joker double points on 8 November. Please click here for full club and individual scores and the complete list of fixtures. There’s a variety of races through the winter on trail and fell; If you do any of them your points will automatically count in both the club and individual leagues. Many congratulations to Mick Coe, who won the individual trophy for the summer season. For a full list of fixtures to the end of March, links to more information and details of points workings please follow this link. We hope there will be something here for everyone over the winter season. Congratulations to Mick Coe, who has won the Airedale Athletics Offroad Trophy for the summer season. 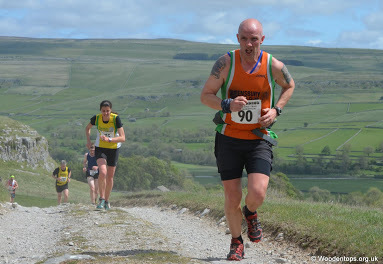 After running six tough races including the Wharfedale Half Marathon and Pendle Three Peaks he consolidated his win with sixth place at Beefy’s Nab on 20 September. It was no easy victory, with fewer than 70 points separating the leading three at the finish. Matt Fielding, Stacey Cleal, Lee Hipwell and Anna Smith were also among the first ten individual league runners and Queensbury finished a good third in the team league behind Baildon and Saltaire Striders. In all 17 Queensbury runners put the team points together, a terrific turnout for some beautiful but challenging events. 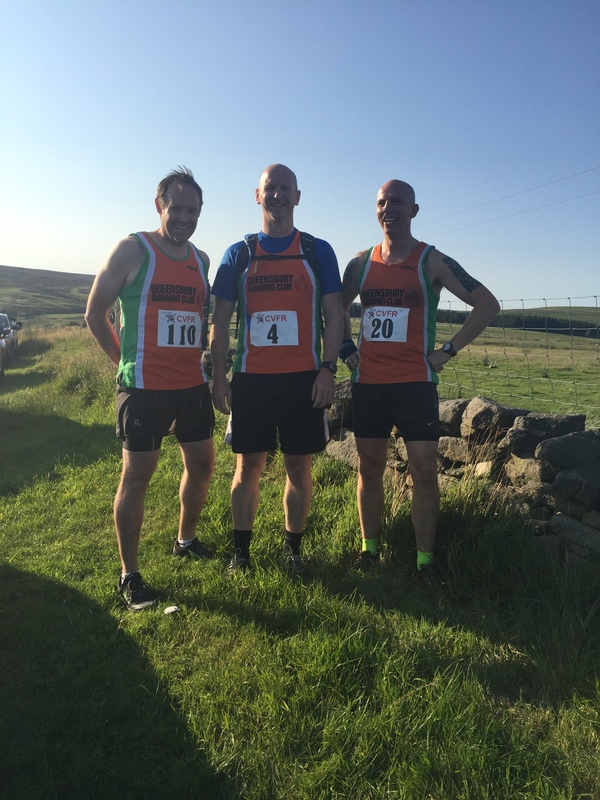 Five Queensbury runners took part in Beefy’s Nab, short but with a hard climb at the start and a rough descent to the finish. Declan Craven was in third place at the top of the Nab, finishing an excellent fifth overall. Matt Fielding was just outside the top ten in 11th place after the rigours of the the Yorkshireman marathon the previous weekend. Stacey Cleal at 18th narrowly missed a category prize and Abbie Cleal (24th) ran a good confident race to finish minutes ahead of her 2014 time. Full results for Beefy’s Nab are here. The final points for the Airedale Athletics Off-Road Summer Challenge are here. If you do any of the Airedale Athletics offroad fixtures your points are automatically added to the individual and team league tables. These are the first fixtures for the winter season – there will be about 15 between October and March so you can choose events that suit you and your best six scores count. More details will be out soon but meanwhile please check online for information including kit requirements. Many congratulations to Mick Coe for his run at the very tough Pendle Three Peaks on 22 August. His time of 2:08:16 over the 9.8 mile, 2,800ft course shows how challenging the event was: after an arduous route over terrain that is unlike anything in the local area the final ascent was the enormously steep Big End of Pendle Hill. Mick is second in the individual league with an event in hand and several other Queensbury runners, especially Lee Hipwell, Graham Jowett and Matt Fielding, have had excellent races to move Queensbury into third team place as the season enters its final weeks. Full results are here. If you’d like to include other events or if you have any other suggestions please let Anna Smith know. Lee Hipwell and Anna Smith ventured to the high Peak District to compete in the Holme Moss fell race. The weather was changeable and the route over 17 miles with at least four enormous climbs including the precipitous descent from Bareholme Moss to Crowden Brook and the scramble up Laddow Rocks the other side. 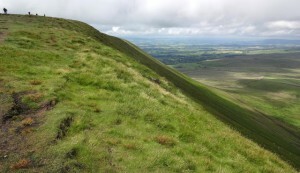 The terrain varied between deep bogs, grassland, peat and the familiar flags of the Pennine Way. After the last climb the race finished with a long mile of road back to the cricket club. The winners, who recorded astounding times, were Matt Lalor of Barlick (2:44:21) and Holmfirth’s Helen Berry (2:56:57). Lee and Anna both did well in a competitive field with Lee finishing in 4:25:47 and Anna close behind in 4:26:08. Queensbury is third in the team league behind Baildon and Saltaire. Mick Coe and Lee are fourth and fifth in the individual league with Graham Jowett, Matt Fielding and Anna also in the top ten. The Pendle 3 Peaks (22 August) and the Tour of Norland Moor (30 August) are both coming up later this month, and training for September’s Yorkshireman is in full swing. For links to the websites please check the Fixtures tab on the points file here. 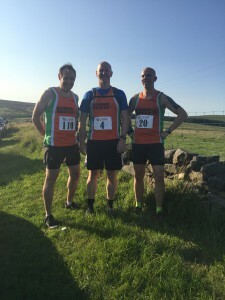 Queensbury are third in the team league after Anna Smith finished 7th lady at the Baildon Canter and Matt Fielding, Mick Coe and Lee Hipwell counted as 8th club team at Widdop with Mick also finishing third in his age category. All three, along with Graham Jowett, are well placed in the leading ten individuals. Full details of points and the next fixtures are here. Matt Fielding and Lee Hipwell both ran excellent times in misty conditions at Reservoir Bogs (20 June), a Calder Valley race which can only be navigated on the hoof because the route is changed each year. Lee ran strongly throughout to finish in 1:20:34 and Matt made up more than 20 places between the first checkpoint and the finish to complete the course in 1:06:59. The winner (James Logue, 0:50:27) was 8 minutes ahead of a group of ten finishing together, so the Queensbury times are a fantastic achievement. Matt and Lee are 17th and 18th individuals in the challenge (Mick Coe and Graham Jowett 4th and 5th). The next fixtures are the Baildon Canter (11 July), Widdop (15 July) and Holme Moss (19 July). They’re very different races – details are on the fixtures tab with the full points table here. 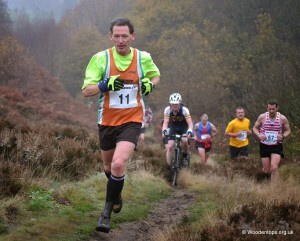 Baildon is a lovely three mile run over the moor followed by a junior race on a bracken-covered slope. The junior event is great for all from keen, fast junior runners to younger children who can go round with their parents. Please click here for details.